Q. Do we provide any free sample work to the students in response to their enquiries? A. The writers in our team are none other than the Lecturers, Senior Lecturers & Professors working with esteemed universities in the UK. These writers work on their own terms and they don’t provide any work for free. Hence, we are unable to provide any piece of work for free. Q. When is a student required to make payment to us? A. We accept 100% payment in advance for academic research papers i.e. PhD Thesis, Dissertations, Assignments and Coursework. The student is required to make payment for the required work in advance at the time of placing an order with us. Q. Do we provide free amendments? A. Of course, we provide free amendments after a student forwards his/her supervisor’s feedback to us. We make suitable amendments to the draft on the basis of supervisor’s feedback so that the student gets nice grades from his/her university. However, if we are asked to rewrite major portion of any research paper due to lack of proper guidelines provided by the student in advance, or due to any wrong instruction or information given by the student, he/she shall have to pay for such amendments in full. We follow a fair and simple rule for providing amendments – “Small amendments are always free, but loss shall be borne by the person who makes mistakes. If mistake is ours, we’ll provide free amendments, but a student shall have to pay for those amendments that are required to be made owing to his/her mistakes”. Please feel free to check out our amendment rules in detail. Q. When is a piece of work delivered to a student? A. 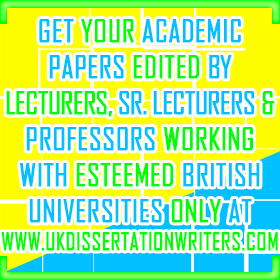 Deadlines for delivery are agreed upon in advance by both the student and UK Dissertation Writers, and every piece of work is delivered in accordance with the agreed deadlines, provided payments and sufficient inputs are received on time. Q. Why aren’t we providing an option for telephonic communication with our website? A. We have adopted a simple and safe mechanism to ensure confidentiality of our work and interaction with students, i.e. communication via emails only. We don’t provide any option for telephonic or face-to-face communication to our clients. Other websites pretend to provide customer service by means of telephonic contact. But, such websites might use your telephone number to trap you into the vicious circle of blackmailing. Hence, if you want to keep your identity safe and undisclosed, NEVER EVER USE TELEPHONIC COMMUNICATION WHILE DEALING WITH ANY WRITING SERVICE PROVIDER. Q. What inputs would a student essentially need to provide us with? A. If we accept any piece of work from a student, he/she is essentially required to send us a correct and complete set of instructions and guidelines in relation to the required academic paper in advance. The student is also required to share his/her own ideas about the required piece of work so that our respected writers could provide personalised solutions in the best possible manner. Data collection would be the sole-responsibility of students.